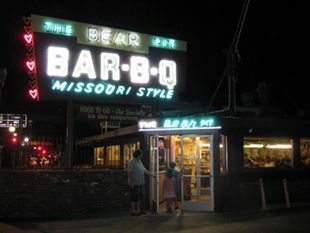 The Bear Pit’s history began in the late 1940’s, when original owner Ben Baier moved from Missouri and started a small barbecue shack in Newhall, California. After several years the popularity of his food spread, so he decided to move to northern San Fernando Valley town of Dennis Park (later Mission Hills ) and start a small take-out restaurant. He partnered with Don Carrow (of Carrow’s Restaurant fame) and had country singer Tennessee Ernie Ford as an early endorser of the restaurant. He built a small building at this location. He constructed a brick oven, called a pit, and used local hardwoods to slow smoke beef, pork, spareribs and chicken. His unusual vinegar-based coleslaw and sweet barbecue bean recipe became the backbone of his menu. 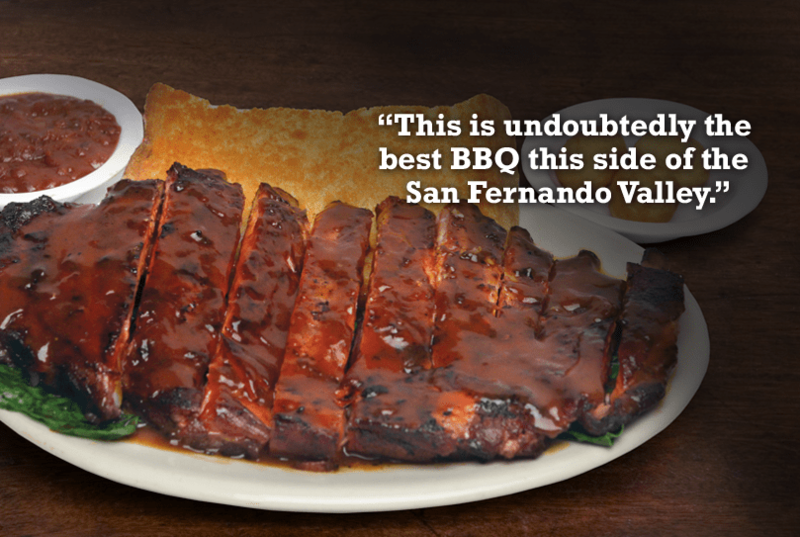 As the San Fernando Valley grew from being an agricultural community to a major city, the Bear Pit grew along with it. In the early 1960’s, the restaurant was sold to Ruben and Bea Gordon. 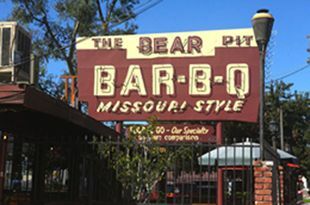 The Bear Pit became a landmark in the Valley, so Gordon built two more Bear Pit restaurants in Canoga Park and Glendale. In 1976, the Gordons decided to retire, so they sold the chain to Burton and Shirley Schatz, veteran restaurant operators. The Schatz’s kept the original recipes, but added many new items, such as barbecue turkey, beef back ribs, and especially Shirley’s New Fashioned barbecue sauce. Her own invention, Shirley’s sauce was an immediate hit, and became almost as popular as the original. By 1988, the Schatz’s decided to retire, sold the Glendale and Canoga Park restaurants, and sold this restaurant to their son, Andrew, in 1988. He has continued the traditional recipes and cooking methods to this day, adding baby back ribs and Louisiana hot links for a wide variety of tastes.